The decor inside is mostly "traditional pub", with a patterned carpet, banquette seating, and half-panelled walls. There's an interesting little corner to the left of the bar which combines an armchair, fireplace, bookshelf, and piano with a quiz machine and a disco ball. The gantry above the bar is decorated with fairy lights and a plastic vine with bright red berries. Fake flowers sit in small vases on the tables (in water, for some reason). Kake and James visited on a Tuesday afternoon and evening in October 2010. There were four real ales on: Courage Best and Directors as regulars, and Abbot Ale and Moorhouse Black Cat as guests (we'd just missed Ascot Ales Posh Pooch, which was finished just before we arrived the first time, and had been replaced by the Black Cat when we returned some hours later). We paid £3 for two halves. Two flatscreens at opposite ends of the pub were showing different sports (boxing on one, gymnastics on the other). Music was playing. The landlord was very friendly and chatty. According to the 2011 Good Beer Guide, there's a log fire in winter and a monthly quiz on a Tuesday. According to their website as of September 2010, food is served noon-2:30pm Mon-Sat. 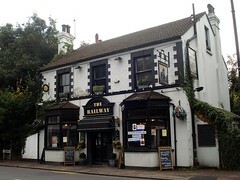 Kake's verdict: My favourite of the five pubs we visited on our day out in Cheam. Accessibility: Small step/ridge to get in. The ladies' is down some more steps. Last visited by Kake and James, October 2010. Opening hours taken from the 2011 Good Beer Guide. Last edited 2015-09-12 14:08:15 (version 10; diff). List all versions. Page last edited 2015-09-12 14:08:15 (version 10).